He’s back, and he’s got his mask. Michael Myers is an intimidating guy. That big, hulking visage. The creepy mask. For fans of the horror franchise, and even people who just see that look, he’s the stuff nightmares are made of. 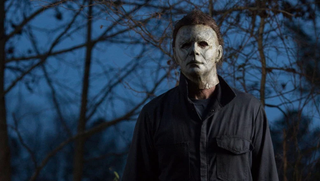 Even, it turns out, if you’re Danny McBride, the actor and writer who along with David Gordon Green and Jeff Fradley wrote the script for the rebooted Halloween movie. In a delightful story for Entertainment Weekly, McBride recounts how, being a huge horror fan growing up, Myers had an outsized effect on him—so much so that, when James Jude Courtney, the actor and stuntman who plays Myers, showed up on set in costume, McBride kind of freaked out. Presumably, McBride did eventually meet with Courtney. But it was not that day. Truly, we commend him for his bravery. The new Halloween opens in theaters October 19, 2018, and we thought it was pretty rad.